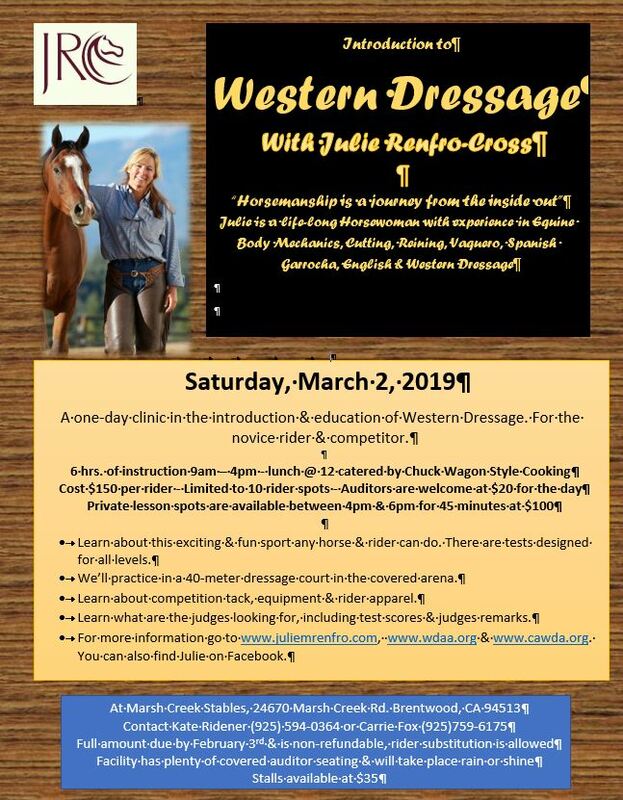 A one-day clinic in the introduction & education of Western Dressage. For the novice rider & competitor. 6 hrs. of instruction 9am – 4pm - lunch @ 12 catered by Chuck Wagon Style Cooking Cost $150 per rider - Limited to 10 rider spots - Auditors are welcome at $20 for the day Private lesson spots are available between 4pm & 6pm for 45 minutes at $100 Learn about this exciting & fun sport any horse & rider can do. There are tests designed for all levels. We’ll practice in a 40-meter dressage court in the covered arena. Learn about competition tack, equipment & rider apparel. Learn what are the judges looking for, including test scores & judges remarks. CAWDA Members note: This clinic qualifies for 2019 CAWDA Perpetual Education award.